This week, I spoke with Mark Kabban of Youth and Leaders Living Actively – “Yalla SD” – in San Diego which provides tutoring, ESL support, college prep classes and educational technology programming to 450 students in the area. Peter’s father was an anesthesiologist in Iraq until the war turned his family into displaced refugees in Lebanon. They lost everything. Instead of going to school, pre-teen Peter sold snacks at a nearby airport to help support his parents and brother. By the time they were granted asylum in the US, Peter’s education was behind, and he didn’t speak a word of English. But soon after his family relocated to San Diego, Peter joined YALLA. He met friends and got help with schoolwork and college applications. Five years later, Peter is a sophomore at Berkeley and was just accepted into the highly competitive Haas School of Business. YALLA was made for the thousands of Peters currently living in San Diego. The organization, led by its founder, Mark Kabban, is on a mission to confront social and economic barriers that confront refugee kids. Mark said he’s always wanted to help people. In school, he was the kid who sat in the back of class and daydreamed about speech-giving and change-making. Later, he pursued those visions. His first job after college was as a refugee case worker, resettling 150 families in his first year. “I got to know all these families, and one thing that really stuck out to me was the kids,” he said. Mark said he could relate to these children because he was once a refugee child in Lebanon. YALLA focuses on getting their elementary & middle school students up to speed so by college they’re ready to pursue an education. Tasha Griffith, YALLA’s Development Manager, said international students are particularly at risk, as 1 in 3 refugee students and 1 in 4 latino students in San Diego drop out of high school. “It’s not that they’re not smart kids; they just need access to these resources to help in that transition,” she said. The organization uses technology to give its students the academic attention they need. Every kid has their own chromebook or tablet that tracks their academic progress. Two YALLA soccer scholars “study to play” after school. So how do you get school kids interested in extracurricular education? 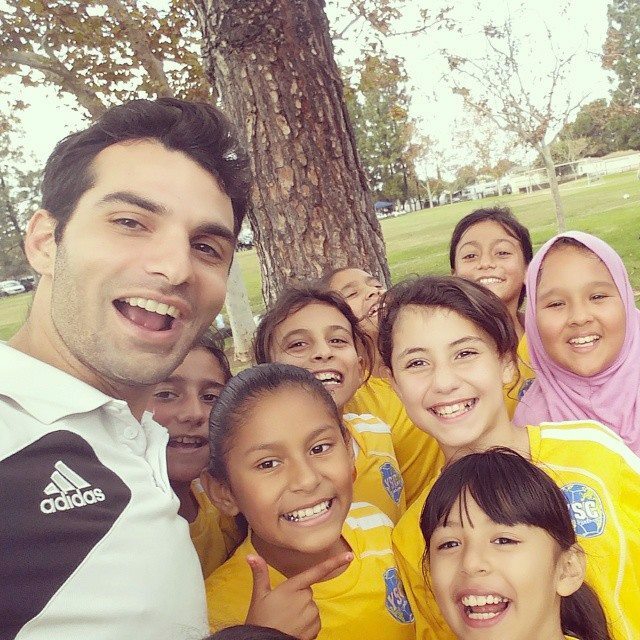 If you’re Mark and the YALLA team, you entice them with an international language, soccer. While many club soccer leagues are “pay to play,” YALLA has a “study to play” policy. 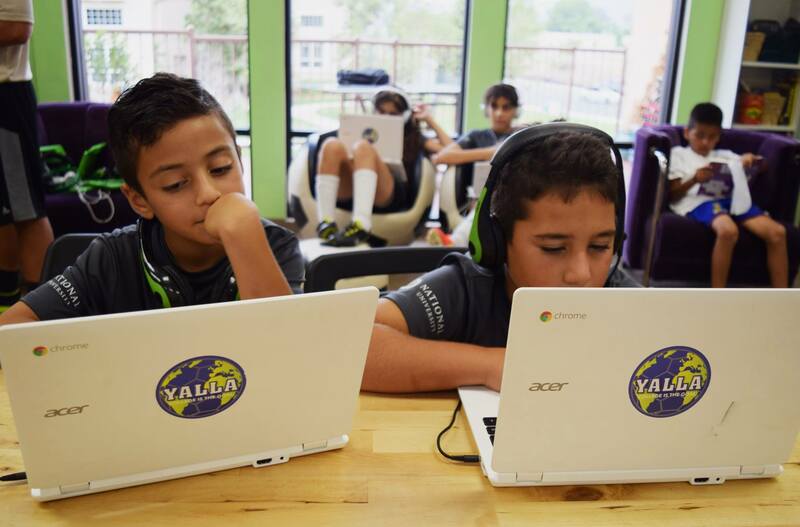 If students want to play soccer, they have to attend YALLA’s after school tutoring. Soccer is the hook, but college is the goal! is YALLA’s motto. YALLA works with kids from all over the world, including Christians & Muslims persecuted for their religion and kids escaping gang violence. They’ve been featured on VH1, CNN, BBC and Disney whose involvement turned one student’s American experience around. Mark told me the story of a young man named Osama who joined YALLA in the 6th grade. At the time, Osama said kids at school laughed at him and called him a terrorist. Soon after, the Disney Channel came and, out of all the kids, chose to profile Osama. “Now when people see that they’ll associate you with something positive,” Mark told Osama. But soccer is only one of the programs YALLA provides its students. College-ready refugees not only face language and education barriers, but many also don’t have the funds to attend a four-year school, so YALLA works to solve this issue by providing workshops on FAFSA filing and scholarship acquisition. The organization recruits older students into their college prep program with an internally-developed 75-minute version of the ACT. Local refugee students who take this mini-ACT receive scores from YALLA along with feedback on what they need to work on to perform better on the test. They’re then qualified to apply for the YALLA college program, which includes tutoring, help applying for financial aid and a College-Con fair (think Comic-Con, without quite as many celebrities and costumes, and including a session called “May the FAFSA be with you”). “Our goal is to be a college hub,” Mark said. And they’re succeeding. School district statistics show that students involved in YALLA had better academic and attendance records than their peers. For YALLA’s class of 2014, 21 out of our 22 seniors were accepted into 4 year schools**. The 22nd was unable to apply because his school transcripts were destroyed in the Syrian War, but he’s in community college and on the transfer track to a pre-med program, Tasha assured me. Mark says he developed YALLA’s wide field of programs thanks to a more idealistic mindset, thinking more about the goal than the work and funds needed to get there. Mark poses with a group of soccer scholars on game day. Mark started working as a private school high school teacher, developing YALLA nights and weekends until the program could afford him as a full-time director. Since then, YALLA has served more than 1200 kids, much in thanks to Mark’s own fundraising successes. Instead of scholarships, he chased grants, and then, private funding. “We’re trying to create a community of people to get behind us,” Mark said. He added that the team goes after corporations that want to do good and share YALLA’s vision. Mark’s visions for YALLA are far from met. Among his short term goals is recruiting more young women into the program. YALLA recruits girls into the program by connecting with their families and encouraging them to enter their daughters into the program as well. One of these promising young women, Hilda Nissan, participated in a TEDx talk thanks to YALLA staff’s coaching. Unfortunately, refugee crises aren’t slowing, and while our leaders work on the big picture, it’s great to see organizations like YALLA working for the individuals affected and displaced by war. **According to YALLA’s annual report.